As a veteran of six (as of this year) E3s, I have begun to enter the show with a certain amount of confidence. “I’ve done this all before” I tell myself, “I’ve got this.” Every single year, this show finds some way to prove my confidence premature. For the first time since I started going to this show back in 2010, I had a lot of genuine difficulty logging time on a Sonic game. Or really, any game SEGA or Atlus had on display. Limited kiosks, long lines, and dozens of people trying to funnel into a ridiculously narrow space. 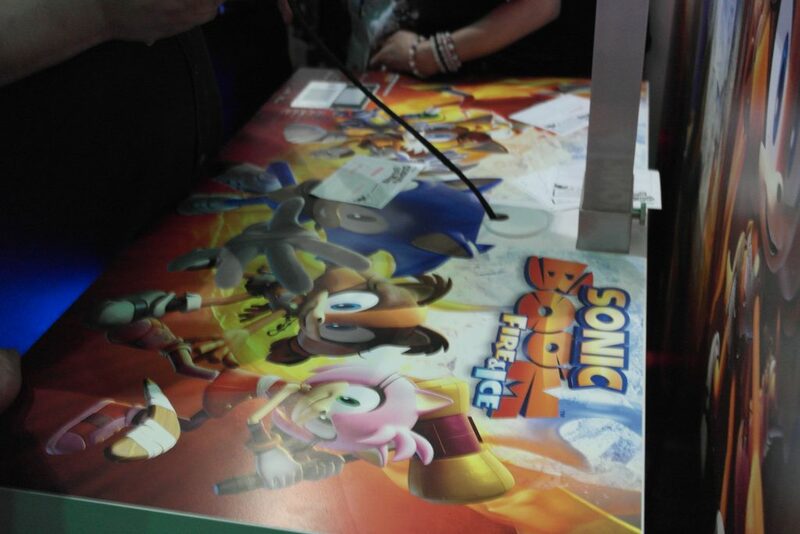 In the end Jason and I were only able to play Sonic Boom: Fire and Ice at the booth. But while I may be whining (a lot), E3 still remains the most exhilarating event to experience and cover in this industry. We spent the first few hours of the day trying to do our jobs at the SEGA booth, navigating the tightly packed kiosk, waiting in line for Sonic Boom, playing Sonic Boom (we have first impressions near the bottom of this article) and finally, attempting to organize an interview with Fire and Ice producer “Chibi” Lola, who told us to schedule it at the front desk, which promptly told us to navigate through the maelstrom of gamer madness to organize it with Lola. It was at this point that we decided to go somewhere else and hope that the booth would clear out a bit later in the day. It didn’t, but we did at least experience one of the coolest things I’ve ever played at this show: Dead and Buried a wild west themed shoot out game on the Oculus Rift Touch developed by Insomniac. Since this isn’t Sonic related, I’ll make this brief: Dead and Buried sold us both on VR. The Oculus headset display is beautiful, giving the western environment depth that was so real I kept absentmindedly trying to touch and lean on the things in front of me. You controlled two guns independently with two touch controllers, which could also act as gripping hands, for either unholstering your guns or grabbing dynamite. You could also duck behind cover, and even sit on the ground. The game registered almost everything perfectly, though my vision kept getting blurry from the headset shifting while I played, and I had some trouble getting a hang of the guns, which helped us get obliterated by the enemy team. A simplistic, but extremely impressive example of what VR can do. 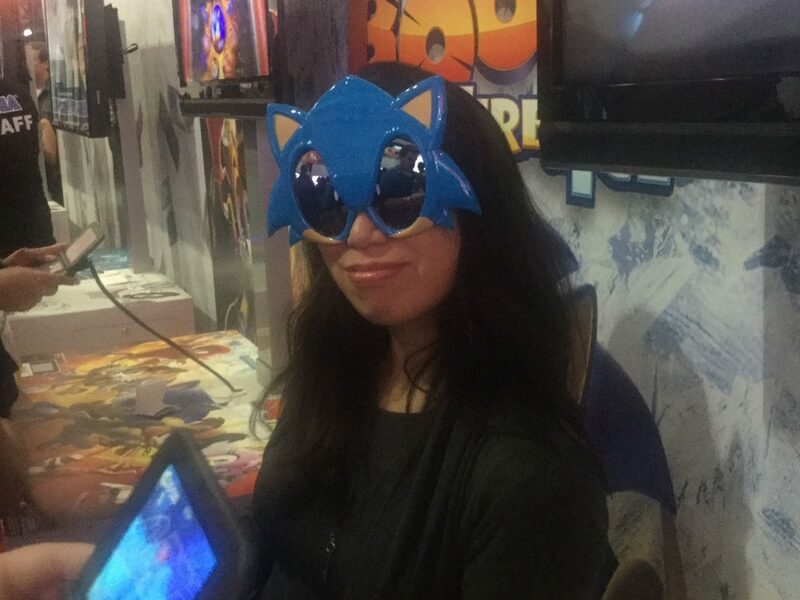 Afterwards, we swung by the SEGA booth again and, seeing that things hadn’t improved, we decided to see if the Sonic LEGO piece was playable at the Lego Dimensions Booth. 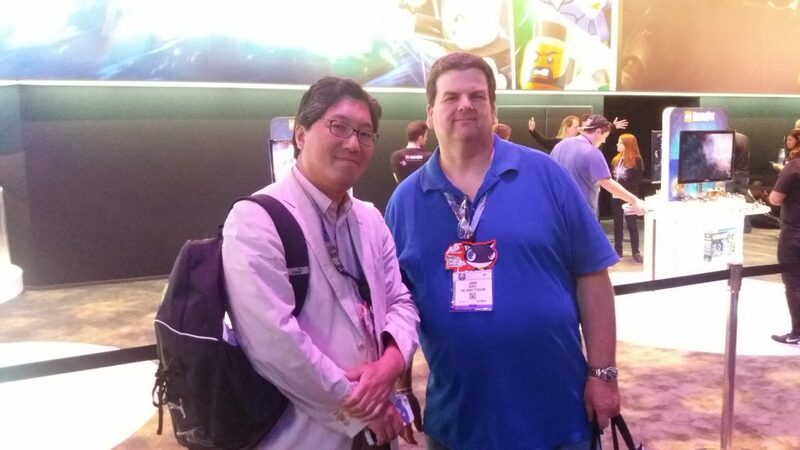 It wasn’t there, unfortunately, but an even bigger surprise was: Yuji Naka. We briefly said hi, and he was then gracious enough to get a picture with us. This is the fourth time I’ve met the man and I still haven’t had the guts to ask for a picture. He seemed happy to see Sonic in the Lego Dimensions logo! Naka wouldn’t be the only famous person we’d pass by today either: we also passed by Toshiro Nagoshi (creator of Super Monkey Ball and Yakuza) and Dante Basco (the voice of Zuko from the series Avatar). Finally, after Lego Dimensions proved to have nothing for us, we decided to just ignore the crowds and finish the Fire & Ice demo so that we could write up our previews. But, as it turns out, the demo was far longer than we initially thought, featuring 9 whole stages. Unwilling to write previews based on incomplete impressions, but with a long line forming behind us, we were promised that we could play through the whole thing in one shot if we arrived early tomorrow. While we cannot write a preview yet, we can at least include some early (incomplete) impressions. My first experience with the game was mixed. Between switching characters, switching elements, and the various unique moves each character can pull off, there is a lot to take in. But during my second time with it, as I began to get into the rhythm of switching between fire and ice to melt through obstacles and freeze platforms, things began to click and feel like natural platforming mechanics. That being said, switching between characters with the d-pad feels sluggish, and the touchscreen is a little too out of the way during game play to be a reliable alternative. But when the level design focuses primarily on one character, everything flows a lot better. The level design seems to be more horizontal and less convoluted than Shattered Crystal, but still feels very different from a typical side scrolling Sonic game. By the end of my time with it today, I was happy with it, but my worries have not yet been fully alleviated. My first level was a tunnel special stage, like the ones from Shattered Crystal, except now with ice and fire elements added for extra challenge. I couldn’t even get through it. After that, I got to play a one of the demo’s regular sidescrolling levels. Here is where you find you’re first major improvement over Shattered Crystal: character switching and exploration are almost completely optional. I looked around using Amy and Tails at one point, but then I played straight through the level again just using Sonic. It makes the game flow much better. The demo also has a racing level that is similar to the Sonic Rivals-esque levels the first game had, only with bots. The cool thing is you can collect scrap around the levels and improve your robots speed and strength stats. There was also a short, fun top-down shooter level using Tails’ hovercraft where you shot down icebergs, dodged whirlpools and grabbed pink crystals. Finally, I tag teamed a giant Tiki boss with Sonic and Amy. The boss took up two screens and changed its patterns depending on if you were Amy or Sonic. Tagging in was done automatically here to make things easier for the player. You can expect our full, in-depth impressions of the entire demo tomorrow! 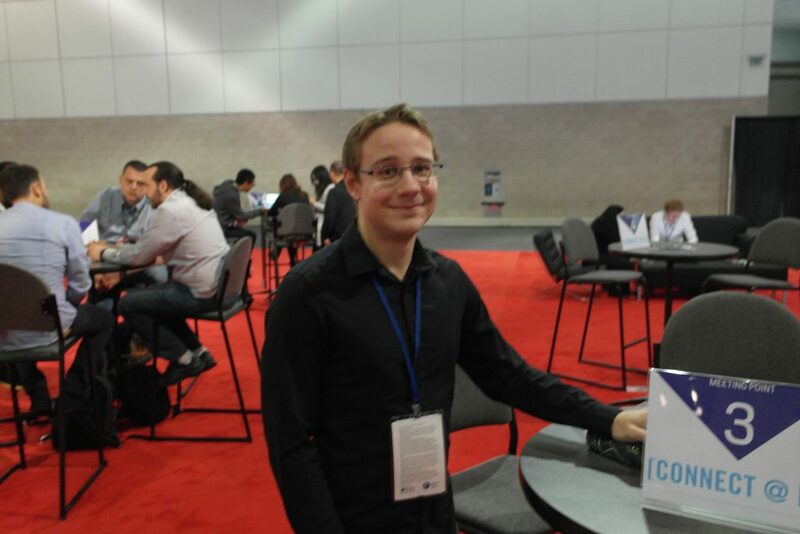 After logging more time with the game, we got an interview opportunity with Sonic Brand Manager (and our old acquaintance) Aaron Webber at an E3 meet and greet area in South Hall. The interview came on short notice and we didn’t have time to grab my camera stand out of the car. 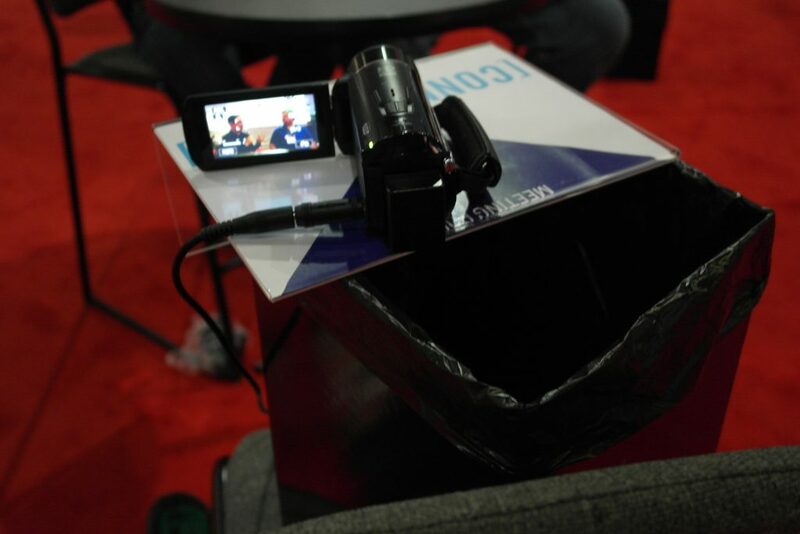 Since I cannot hold a camera steady to save my life, I had to jury-rig one out of a chair, a waste basket and a table sign (pictured below). Never underestimate the utility of waste baskets! The interview will be going up tomorrow, so keep an eye out for it. As the day wound down, we had just enough time to check out the Sony booth and play some Yakuza 0. Jason got to help a music band of faux yankis look cool in front of a crowd. I got to beat the crap out of some street thugs. These Yakuza games truly are extremely strange and hilarious. So ended our first day of E3 2016. Be sure to stay tuned tomorrow (or later today for most of the world) as we bring you more impressions, interviews, and experiences from the Electronic Entertainment Expo! I hope the switching mechanics get sorted out (maybe the game still needs for polish). Though I take it as a good sign that they’re letting people play more levels– it makes it more likely that the developers aren’t hiding stuff like they did with SC and RoL. Good to see that the levels flowed bette– that was a major issue in SC. Though the special stages seem kinda cheap. Aaron Webber looks a bit tired, lol. 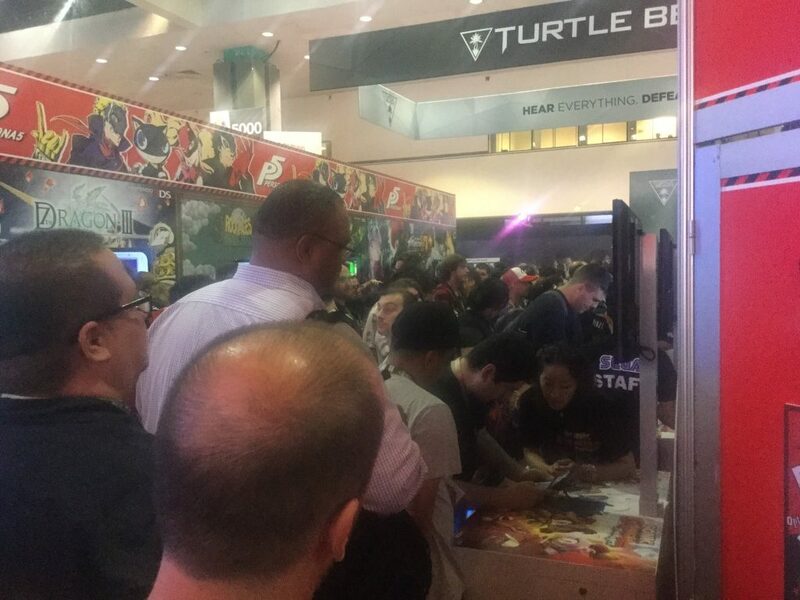 It can’t be easy to manage an event as large as E3. Major props. Finally, a Fire and Ice impressions! The only other one I’ve seen is from GameInformer and I hope videos get released soon. Looking forward to the interview! Nice to hear that the game’s actually good. They did not announce the 25th anniversary title at E-3 oh well I guess we have to wait until the time comes. Wow I like how Sega of Sonic Boom Fire & Ice New Sonic Game is supposed to be I’m liking Sonic Boom Fire & Ice for Nintendo 3DS!